Business co-owner and author Marc Renson takes you on an entertaining and outrageous journey of madness and mayhem experienced in the daily operation of Ambition, one of downtown Schenectady, New York’s most popular restaurants. Read about the celebrities who eat there and meet “the regulars” who keep the staff alert with their cosmic questions: Is the sandwich special good? Does your cream of tomato soup have milk in it? Will the Cajun spices bother me? 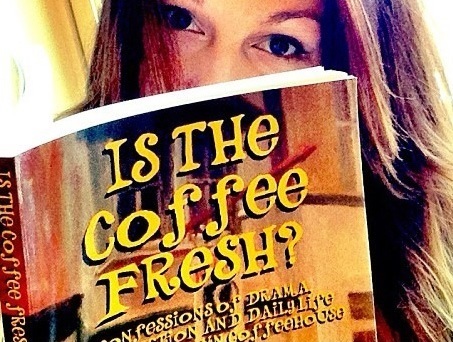 And of course… Is the coffee fresh? 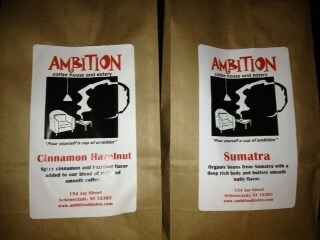 Pour yourself a cup of Ambition… coffee, at home! We sell our delicious, aromatic coffee by the pound and half-pound. 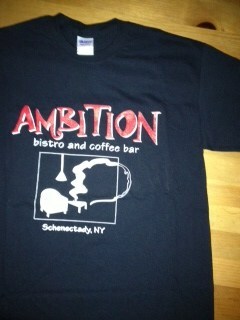 Tell the world you got Ambition! Men’s and women’s style t-shirts are available in black, blue, yellow and green. 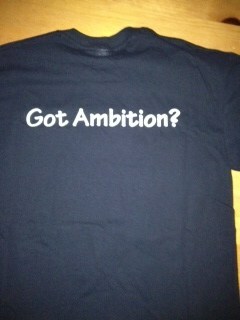 Ambition logo on front, “Got Ambition?” on back. Only $14 plus tax and shipping. How do I buy this awesome Ambition stuff? 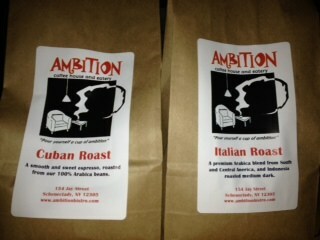 To avoid shipping charges, please come into Ambition and purchase here. Or, until we get our online purchasing up, please just let us know what you’d like to purchase and we’ll make it happen!